Riders who race consecutively, every week, in the same class shall be eligible to participate in the MSC Bonus Points Program. Only MSC Members shall be eligible. 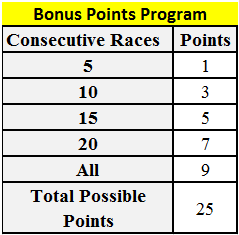 These points are awarded for reaching milestones listed below on the Bonus Points Program Chart. A rider must race the same class 5 times each MSC Points Event consecutively to start accumulating bonus points for that class raced. Riders who race less than 5 races are not eligible. Riders who do not race the same class 5 times in a row are not eligible. 5 Consecutive Races = 1 point per class, 10 Consecutive Races = 3 points per class, 15 Consecutive Races = 5 points per class, 20 Consecutive Races = 7 points per class, All MSC Scheduled Races = 9 points per class. Race cancelations by track do not affect eligibility. Once a rider breaks racing consecutively with MSC scheduled events per class, that rider will start over from the beginning in counting races for the Bonus Points Program. If a rider breaks racing consecutively and the rider earned points in the Bonus Points Program, the rider will retain those earned points. Rider MUST BE PRESENT at the track each event to earn points in the Bonus Points Program. Rider A races Plus 25C week 1,2,3,4, & 5. Rider A gets 1 bonus point added to the end of the season points for Plus 25C. Rider B races Plus 25C and Open C consecutively week 1,2,3,4, & 5. Rider B gets 1 bonus point added to the end of the season to both Plus 25C and Open C.
Rider C races Plus 25C week 1,2,3, 5, & 6. Rider C is not eligible until he continues with race 7, 8, & 9.